The first of Cara Black's "Aimée Leduc investigations," Murder in the Marais, was published in 1999 but set in 1993, in Paris of course. 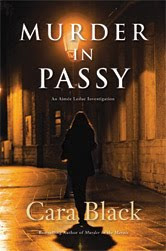 The 11th and newest in the series, Murder in Passy, has just been published but is set in 1997: Aimée is progressing more slowly into the future than her books are. The historical distance allows some temporal ironies regarding technologies that Aimée and her cohorts are exploiting in their infancy (GPS is one), and also allows (rather in the fashion of French crime writer Dominique Manotti) some historical events to anchor the stories (in the case of Murder in Passy, it's the Basque presence in Paris, including the region's militant factions. I've recently mentioned, in a review of a quite different book, the difficulties of picking up a series in the middle. It's not really a problem with Black's books (pun not intended, if you remember the U.K. TV show of that name), except that some of the running characters surrounding Aimée come and go rather quickly in Murder in Passy, the reader's awareness of who they are depending on prior knowledge of her career. But it's the most prominent of the regulars, Morbier, her cop-godfather, and René, her vertically challenged partner in Leduc Investigations, who carry most of the weight anyway. Aimée becomes involved in Morbier's love life, making an appearance in his place at his recent amour's daughter's wedding rehearsal party—where a murder occurs, implicating Morbier himself. And with Morbier's less than collegial relationship with his colleagues, they are only too happy to stop looking for the murderer once they haved evidence against Morbier. As Aimée mobilizes in his defense, against his own wishes, she becomes involved in Basque separatism in various forms, as well as embedded in the history, architecture, life, and culture of the Passy neighorhood (one of the pleasures of the series is Black's detailed evocation of the neighborhood's of Paris, as well as the city as a whole. My husband loved MURDER IN THE MARAIS.